First I just want to say how beautiful the covers for Emma Mills books are. I know this has no bearing on the quality of the story, but boy are they pretty up on the bookshelf. They are pretty naked, too! 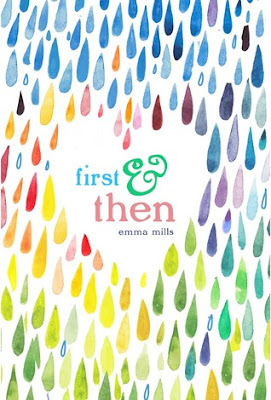 I'm so late to the Emma Mills party. I bought this book all the way back in last October when it was released, then it proceeded to sit oh, so sadly on my bookshelf. Pretty, but sad. I was fortunate enough to acquire an ARC of her second book This Adventure Ends at ALA, but then my conscience got the better of me and I decided I had to read this one first. Order and all that. So here we are in early October and Hurricane Matthew is barreling down on us. With no power and piles of books, I decided that I needed something not about death and destruction, and this little gem is what I chose. And then I got mad at myself for not reading it sooner, followed closely with sadness, because I could never read it for the first time again. Ramble, ramble, ramble...let's get to the point of this thing, shall we? Oh, right, that's probably not sufficient enough for anyone to make an informed decision on whether or not this would be a story for them. Devon, our main character, has had quite the interesting summer. You see, she's quite good at being an only child, but her younger cousin has now come to live with them and it's a little like having a sibling. She likes her cousin, but she gets a little annoyed with him always being around. Foster is kind of an odd kid, and while sometimes Devon really just wants to get rid of him, she's never really outright cruel to him. I loved how we got to see their relationship evolve through the book and how they helped each other evolve. There are boys in this book, of course. Boys that are not related to Devon. Boys that are cute, talented, and infuriating in their own ways. I don't really want to say too much about said boys, because I don't want to ruin the way the story unfolds in regards to them. I will say that things turned out differently than I expected them to, but definitely in a good way. Devon loves Jane Austen, and while Pride & Prejudice is the only Jane Austen book I've read, I thoroughly enjoyed the talk of her throughout the book. Devon speaks about her as if they are real life friends and I thought that was pretty cool, because I know we've all done that a time or two with an author or character we truly love. This was definitely a quick read, but an oh, so wonderful one. I highly recommend it to any contemporary fan and even those who may be a little hesitant to jump into the contemporary pool. Love, love love!